Fiona Mitchell of Bedford, and Love ‘Em and Leave ‘Em (www.leleny.org) will be doing a 10-15 minute presentation at the village board meeting on Monday, Columbus Day. Fiona is active in Bedford’s Leave Leaves Alone www.leaveleavesalone.org. This initiative strives to encourage people to use the most economical and environmentally sound practices with lawn care. Mulching leaves improves the soil, and in turn improves the grass. It reduces the needs for fertilizer and it reduces time spent attending to your lawn, especially in the fall. Instead of spending time and money on removing Nature’s natural fertilizer and soil amender you run over the lawn with your mulching mower – no more raking or blowing, and less leaf waste for the Village to remove. Please come to the meeting to show support for this initiative, and encourage the village board to adopt a leaf mulching resolution that will formalize the DPW’s agreement to mulch rather than remove leaves from village parks, fields and verges. 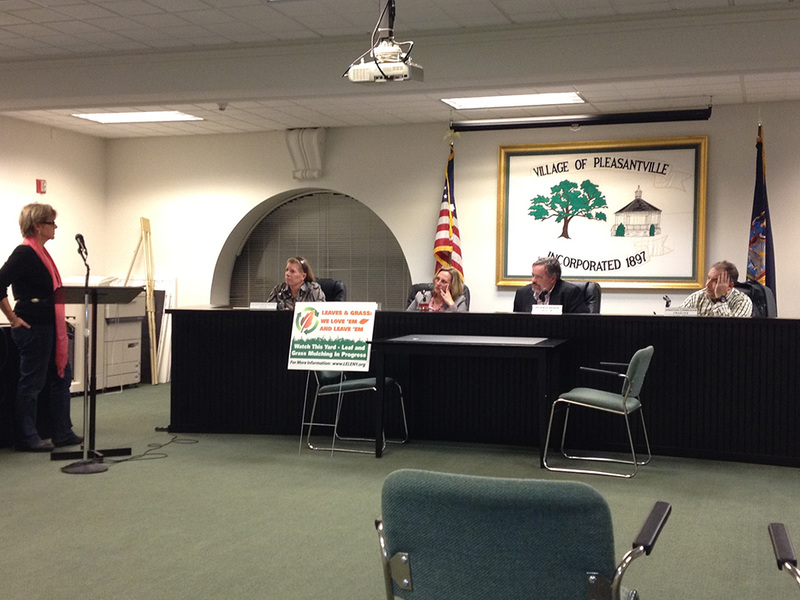 "Fiona gave a useful, straightforward, informative presentation on leaf mulching this evening at the Pleasantville Village Board meeting. She gave persuasive reasons for residents and landscapers to follow this practice – which as she says – is working with Mother Nature, not against her. She fielded all the questions very well, and I am hopeful that we get some converts." Watch the presentation on Pleasantville Community Television - pctv76 (cable) or on the web at www.pctv76.org .